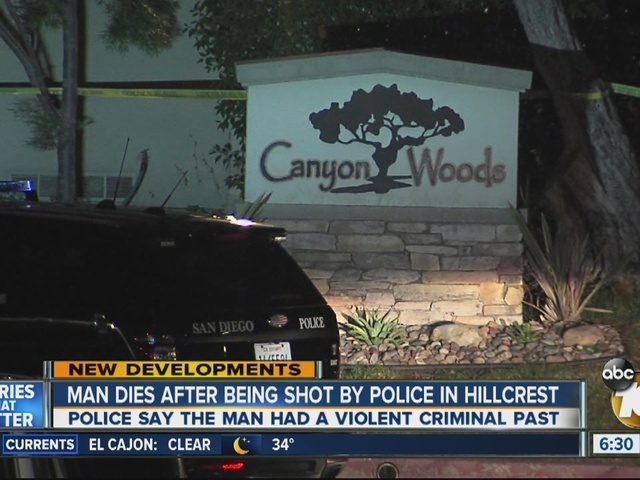 SAN DIEGO -- A San Diego police officer shot and killed a man in Hillcrest late Friday night -- and it wasn't the first time he had been involved in a deadly shooting. Officer Richard Butera fatally shot Joshua Sisson , 30, while responding to a domestic violence incident on Lewis Street. Police say Sisson turned and pointed a large kitchen knife at Butera and was shot in the chest when he advanced towards the officer. "The knife-wielding suspect refused to comply. The suspect aggressively advanced towards the officer with the knife," said San Diego police Lt. Manny Del Toro. After Sisson's death, police discovered he had been wanted on a warrant for alleged felony parole violations. A criminal records check showed Sisson had served prison time for setting a family's home on fire in 2009. He pleaded guilty in that case to 13 counts of attempted murder, one count of arson and one count of carrying a concealed weapon (a dagger). Officer Butera was involved in another fatal shooting four years ago. In 2011, he shot and killed kidnapping suspect Aaron Devenere at the end of a car chase from Kearny Mesa to Escondido.